The debate over the next year's iron ore benchmark prices has got off to an acrimonious start with China seeking to separate its negotiations from other countries while global giant miners refuse to budge downwards on prices. Shan Shanghua, secretary-general of China's top iron ore negotiator China Iron and Steel Association (CISA), said on Friday that iron ore contracts should run for a calendar year instead of beginning on April 1, according to the Japanese financial year. "We will not insist on other countries taking China's iron ore price as a reference," he said at an iron ore conference in the coastal city of Qingdao. The iron ore conference is usually regarded as the unofficial start of benchmark price negotiations for the next contract year. "There may be another failure in agreeing a benchmark price next year, as happened this year, if CISA sticks to its position," a mining executive familiar with the negotiations told China Daily on the sidelines of the conference on Friday. "BHP prefers to use spot prices, which are market-oriented and index-linked," he said. "If both sides are not happy with the benchmark price negotiation, the next year ore trading might again be based on spot rates." Iron ore is the only commodity that is negotiated with a benchmark price system. Other commodities such as copper and oil are linked to an index. 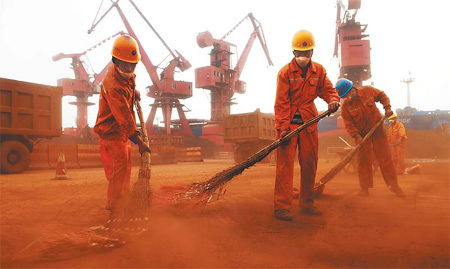 This year's iron ore price negotiations became deadlocked in June when China insisted on a 45-percent discount on 2008-09 prices after a 33-percent cut in benchmark iron ore prices had been set with other Asia steel mills. Shan said Chinese steel mills would not be able to make money at the current price that iron ore producers are demanding because an oversupply is causing steel prices to fall sharply. "If the demand side is always losing money while the supply side is always making huge profits, can that relationship survive long?" he asked, insisting that global miners should offer better terms. Chinese iron ore imports rose 36 percent to 469.4 million tons in the first nine months from a year earlier, the Customs said on Oct 14. Shipments have exceeded real demand by 50 million tons, the steel association said on Oct 12. But mining executives from iron ore producers said the iron ore price was driven by demand, even if the demand side suffers lower profits. As long as the demand is there, there will always be possibility of rising prices. Miners are optimistic because the economic recovery is leading to increased demand for steel. Samarco Mineracao, an iron ore pellet joint venture between miners BHP Billiton and Vale, expects to produce at full capacity next year as demand recovers, its chief commercial officer, Roberto Lucio Nunes de Carvalho, said on Friday. "Our expectation is to produce at full capacity of 22 million tons in the next year," he said. "Industry demand is improving. Next year will be much better than this year." However, some Chinese steel mills are not optimistic about next year's steel demand. China's steel industry may end up losing money next year as oversupply weighs on prices. That might force steel companies to cut production next year, said Han Weidong, deputy chief of the market section of Hebei Iron and Steel Group Co Ltd.
"China's domestic steel demand is unlikely to reach 600 million tons next year, while tight bank lending next year could hurt both demand for steel and expansion at steel mills, restraining growth in iron ore consumption," he said. A sales representative from a Hebei-based private steel company also said his company felt times were hard now because steel prices have fallen sharply since August and the iron ore spot prices remained at a high level. If the situation continues for a month, they may make cutbacks, he said.